The land down under breeds them tough and hardy - none moreso than the Garou. But the harsh outback blisters even their thick skins - and scours their souls. The Garou committed a great wrong here long ago, and the repercussions still haunt them. The Garou must make amends for their past lest they forever remain strangers to the Dreamtime, the spirit world of Australia. 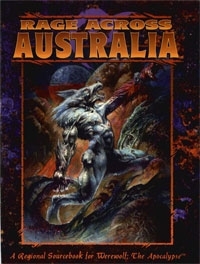 The history of the Garou in Australia. The wild and weird creatures of the Outback. The secrets of the lost Bunyip tribe.